1. first of all, start with a 5 cm ripped strip of fabric. you can use any width, it's depend on you. the longer and the wider one is the bigger rose one. 2. fold the strip in half. 3. roll a few times to get a good tight center. you can glue it to make sure it sticks perfectly. 4. start twist your fabric away from the center as you roll. twist it until the end of fabric. get it? it will look like this, anyway. 5. make about 5 roses or more, up to you. here's i make 5 roses. 6. spread glue all over the bottom side of the flower. cut the other fabric (circle shape) to cover glue. 7. after covering, give some glue on it too. 8. put the roses on the flannel and press the roses to make glue sticking with flannel. 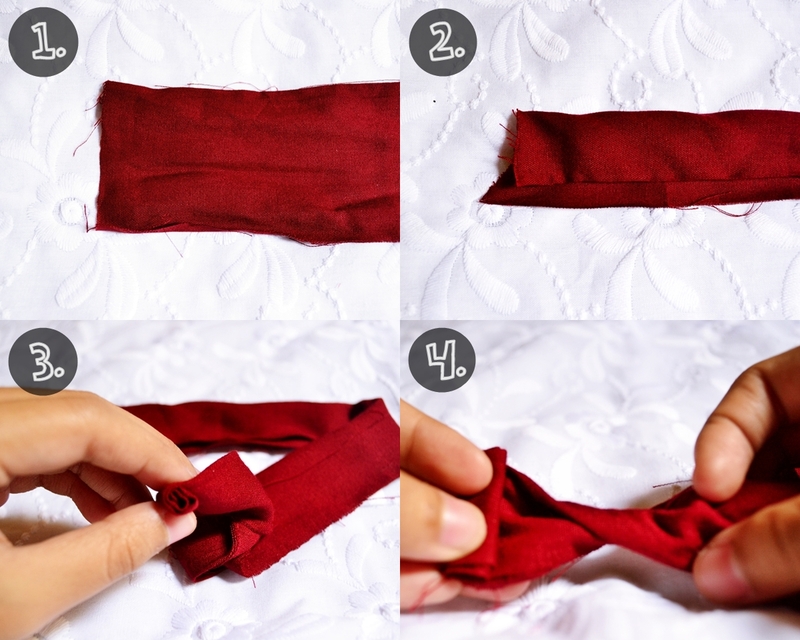 9. cut the flannel corresponding to the 5roses' shape until it forms like this. 10. make a lil hole at right and left edges to put the chain. wow, this is a really great DIY! I love it! Thanks for sharing!